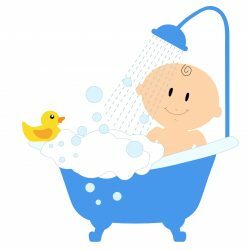 No matter if your children are taking baths or if they have started taking showers, a slippery tub is dangerous. An anti-slip bathmat makes it easier to get in and out of the tub and to move while taking a bath or a shower. You can find anti-slip bathmats that are made just for kids and feature their favorite characters to make bath time that much more fun. Along with a bathmat, it’s recommended to also have a handle for the kids to grab onto as they get in and out of the tub. It needs to be at a level that is accessible to them. If you have room in your bathroom it might make sense to install a child sized sink in addition to the existing sink. A child sink is reachable and makes the whole bathroom experience much more pleasant to the child. They don’t have to use a step stool that can get in the way or get frustrated having to ask for help to reach the adult sink. When a child has their own sink, accidents are less likely to happen. If installing a child sized sink isn’t an option, the next best thing is to invest in faucet extenders on all faucets in the house. Faucet extenders come in fun shapes and designs, such as different animals, which makes using the sink and hand washing that much more fun for kids. When there are small children in the home the first step is to adjust the hot water heater to ensure that water that is too hot isn’t coming out of the faucets. In addition, it’s a smart idea to purchase a temperature gauge that tells you when the water is the right temperature for a small child. Some even float in the bathtub and alert you when the temperature needs to be adjusted. Small children are curious and you don’t want them lifting the toilet lid when it isn’t being used. A toilet lid lock prevents a child from hurting themselves with the lid or accessing the water that’s in the bowl. When a child first learns to use the toilet, the seat is too big for them. A toilet safety seat can easily be placed over the toilet seat for a much safer experience. When it comes to plumbing safety in the home for small children, it’s always better to err on the side of caution. There are plenty of devices that make the home a safer place.